North College has one of the most interesting histories of any buiilding on campus. It began its life in 1823, the third building the College built after South College and the first President's House. 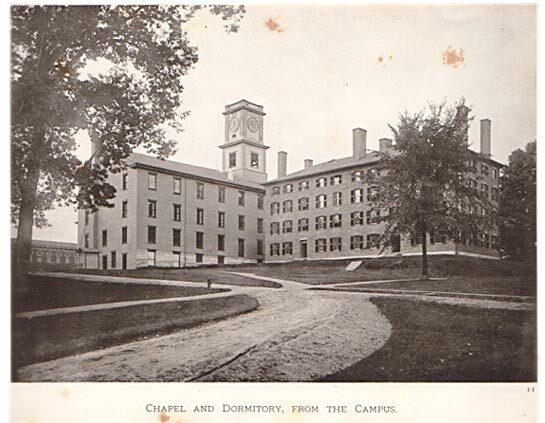 It was designed by Hiram Johnson of Amherst, and was known as North College for the next six years (King, 310). 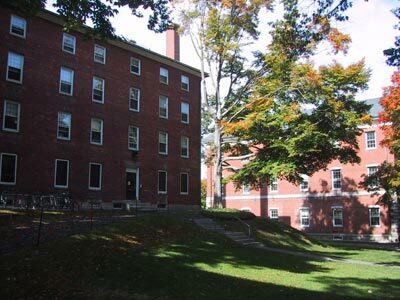 In 1828, another dormitory was built on the present location of Williston, which then became "North," making North College become "Middle College," as it was known from 1828 to 1857. On January 19 of that year, "Old" North College, as it now referred to, burned down, and the name "North College" returned to its original owner. Over the years, North College has served as dormitories, a chapel, a laboratory, and a library, among other uses (King, 310). It is currently a freshman dormitory, and remains one of the best-known buildings on the campus. (Top photo taken 12 October 2001, bottom image from Sunlight Pictures).